Just like when second Niger bridge was commissioned, we thought everything was in place, we never knew it was a scam. Nothing could be achieved when the country was buoyant, now that the country is suffering leprosy of the pocket, Ogoni is to be cleaned. Who is deceiving who? They cannot clean our land; it is time for us to take the bull by the horn, clean our land by ourselves. Freedom is the last hope and Nnamdi Kanu is here for us, we take our freedom and clean our land. Let nobody be deceived or scammed, this is just a scam to divert our focus. I trust this class of fighters, the future is greater than today and that is their motto. When Asari Dokubo said no to amnesty, I only saw a man determined to be free, to own his inheritance and stand firm in what he believes. I saw a sophisticated freedom fighter, fearless and priceless. He knows how much we are hated, he knows that Nigeria can never be our home and they would always find joy in sucking our blood. Just as how amnesty came to lobby us into allowing them take everything we have and give us crumb from her table, Buhari has presented clean-up to buy us as usual. Buhari is making a mistake; this class is not about militancy neither are they militants but freedom fighters, they are not hungry men in search of resource control, they are not men in search of money to feed and cruise round the town, they are not men in search of wealth to paint the city red. 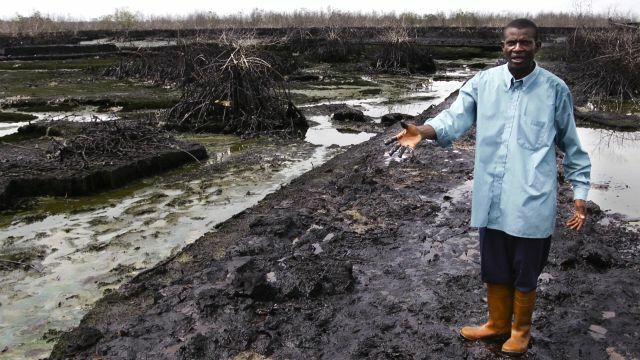 Ogoni clean-up will not solve anything; we need freedom to clean our land to our test. You have polluted our land, you have destroyed our land and now we want to take our land and purify our land. That is what this class is all about, freedom and nothing but freedom. They have come with clean-up that they cannot do, now Nigeria is broke, how can they clean-up our land? Now the government cannot pay teachers, how can they clean up our land? Now hunger is everywhere, how can they clean our land? This is a scam to buy us, they believe Biafrans can be bought any time any day, “give them money and they would go inside and sleep, all they are looking for is money” that is the solution to all our problems, that is their belief. I am convinced time has gone when money would destroy our future, it is freedom or nothing. When we have freedom, we can sweep our dirty home, than a stranger to deceive us that he would sweep a home he has never been to. They came with amnesty, we thought they were serious people; they only gave few men money and used the entire land. Even after the amnesty, they are again chasing our brother- Tompolo around; they want to take everything given to him. It is the gift of the devil that comes with a head but takes a head. After the amnesty, was anything achieved? Did the amnesty lift our afflictions? Did it give us light? Did it stop hunger and lack in our land? What exactly was the benefit of that amnesty? Is the university working? Are they not chasing sons and daughters of Biafra around? Madueke, Iweala, Alameiseigha’s wife being snatched her husband’s properties. Tell me a Biafran they have spared? Anyone or people they gave Ogoni clean-up scam money, they would come back for them and yet Ogoni will never be clean. This Ogoni clean-up scam is gross disrespect to NDA and other fighters who openly made demands. Buhari has not taken men serious and it is very important that he must be brought to his knees, one cannot respect one until one gets one down. Buhari is joking with everything we are and believe in. he has neglected the list given to him and opted for a bait to continue sucking us dry. After messing our land, you take everything from our land and when we complain; you come and say clean-up so that we can further allow you to take our God given inheritance. We are no longer fools and nobody will play the fool this time, freedom can give us clean-up and beyond. It would categorically be noted that freedom is what we want and not clean-up. We can clean our land, we are grown ups, we can make our land better.